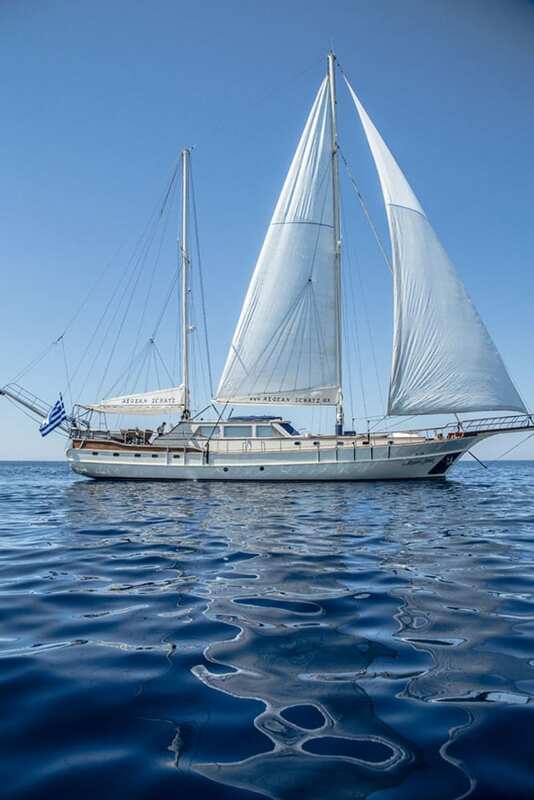 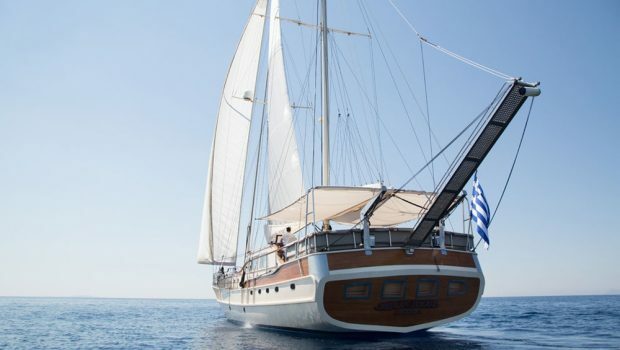 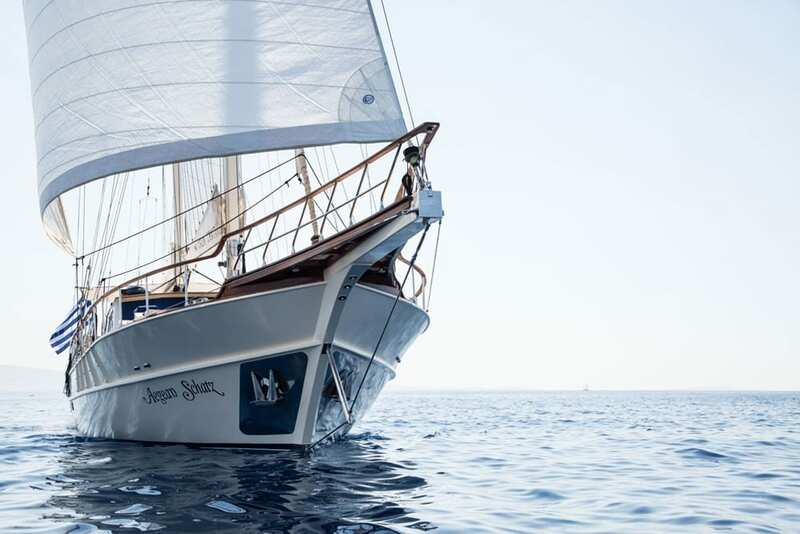 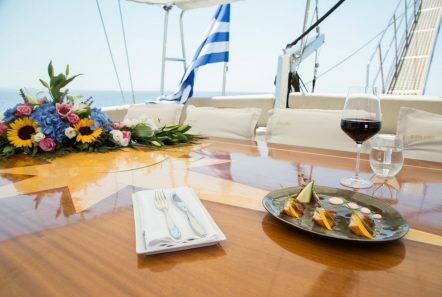 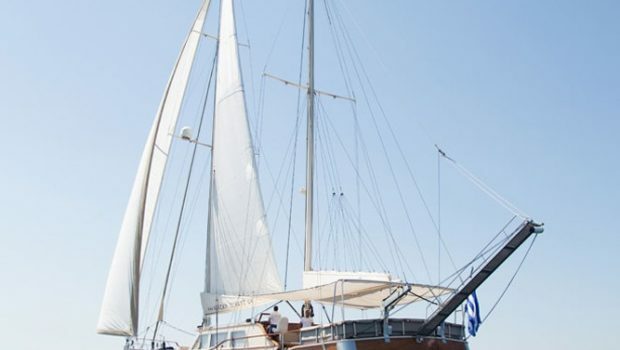 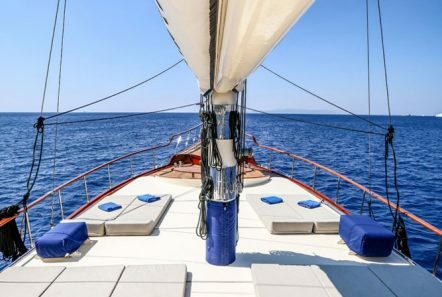 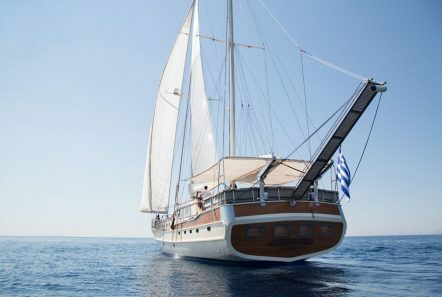 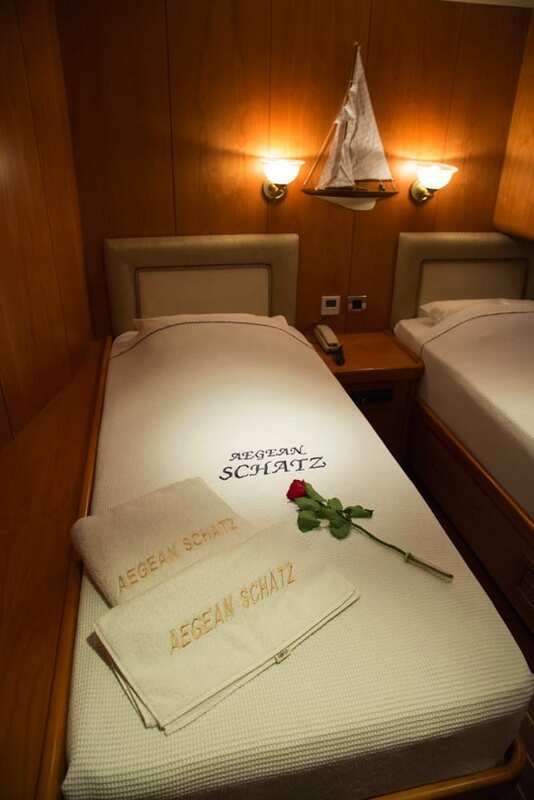 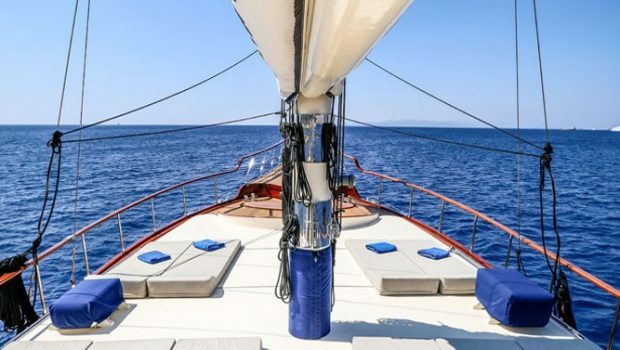 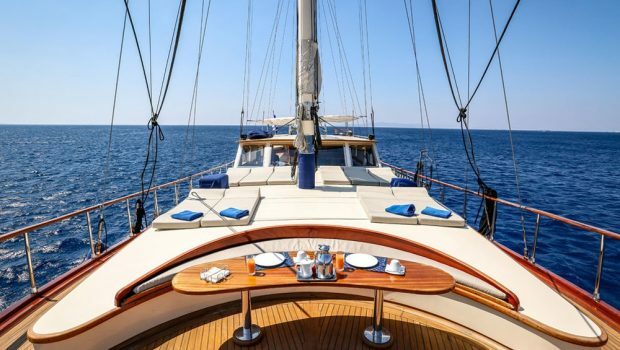 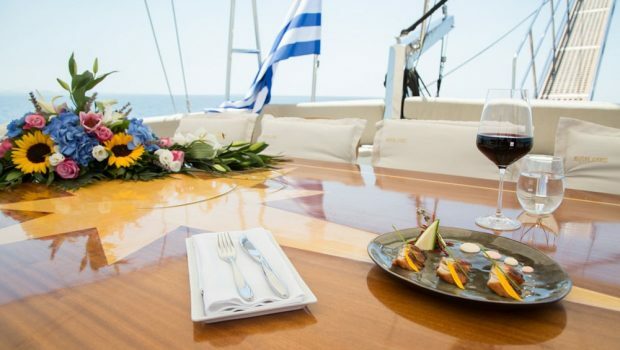 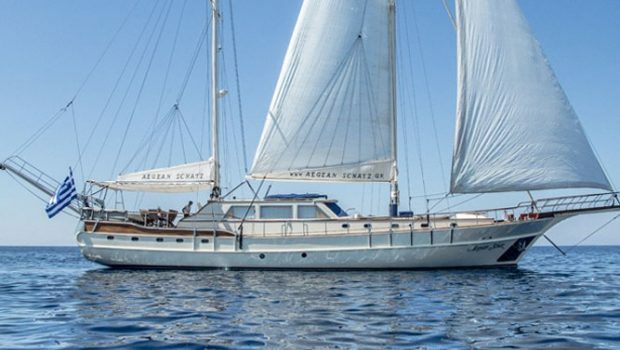 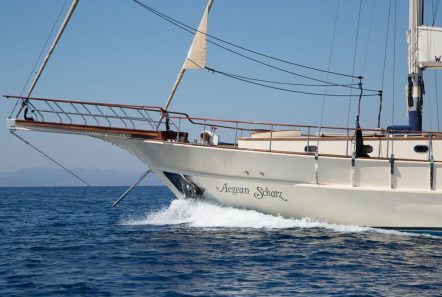 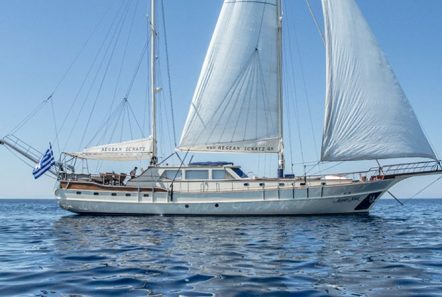 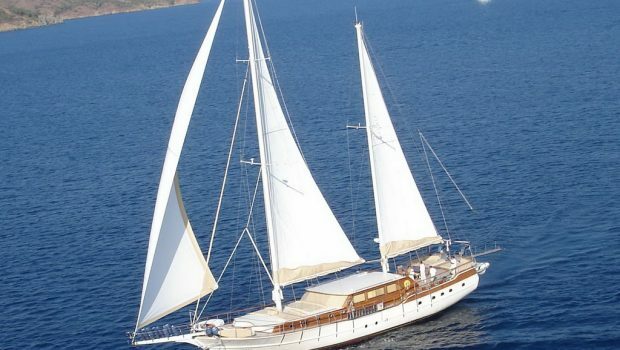 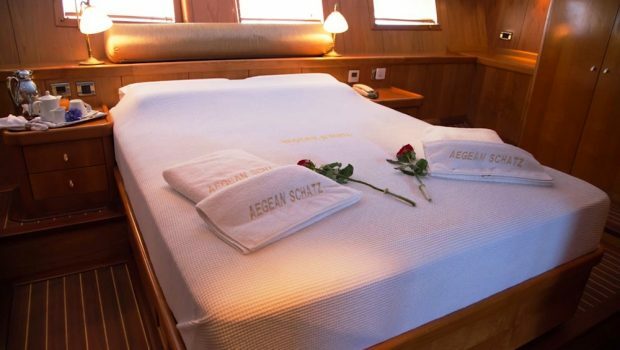 Take a cruise aboard the sleek motor sailer Aegean Schatz for the ultimate in sailing luxury in comfortable contemporary style. Her cherry wood interior with mahogany floors and taupe and beige upholstery lends a touch of the traditional, but remains light and cheery. 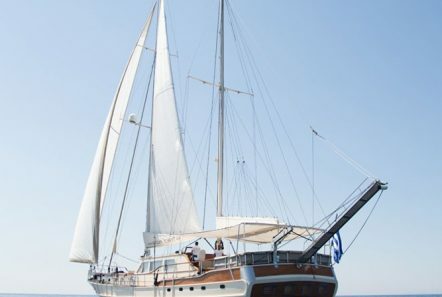 Her sails are operated manually by her crew which gives guests the opportunity to join in the experience of an authentic sailing yacht. 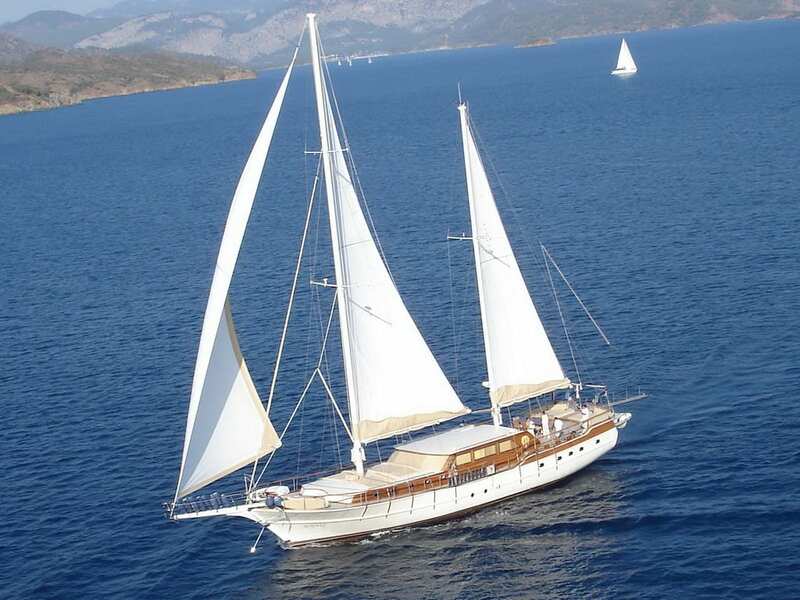 If the winds are not stirring, her two engines can propel her to a cruising speed of 10-12 knots. 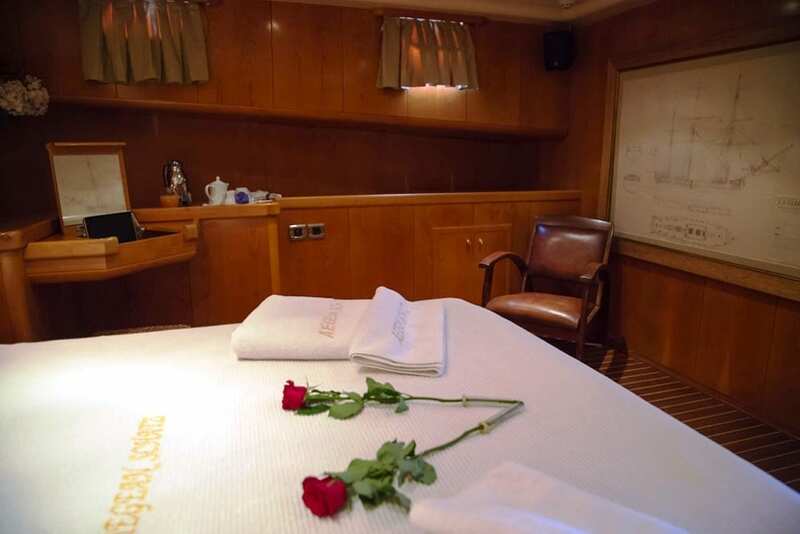 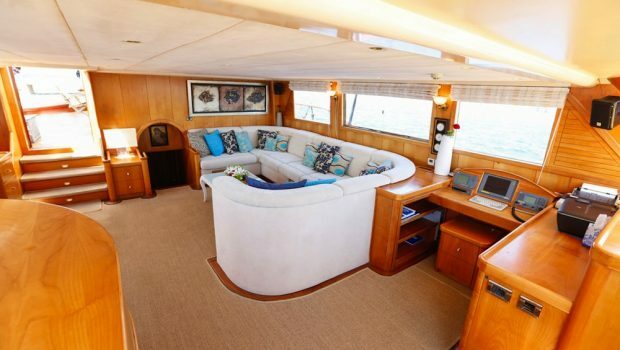 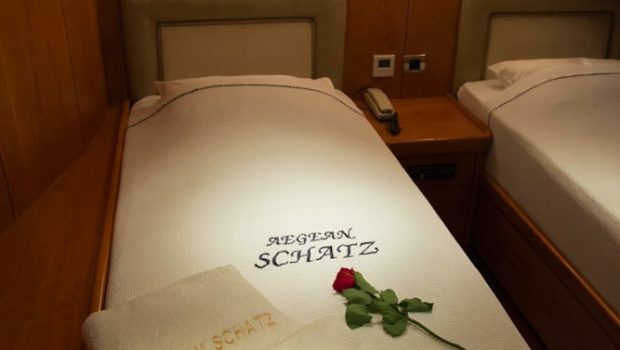 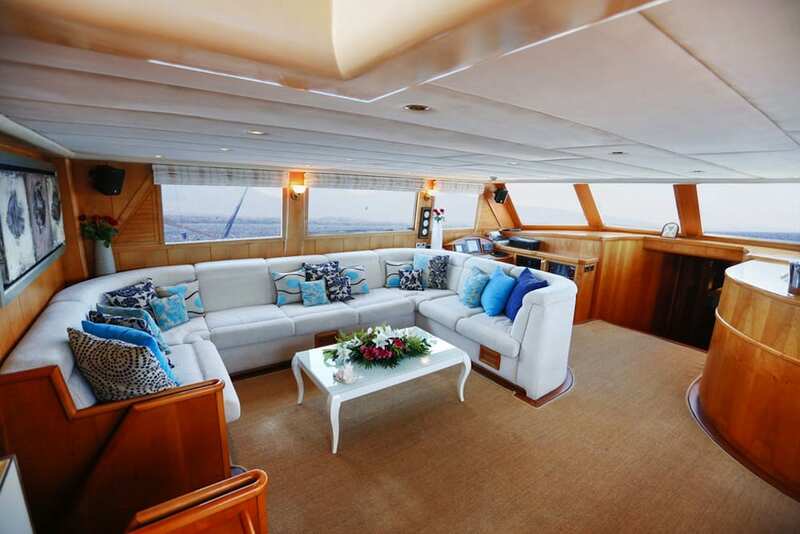 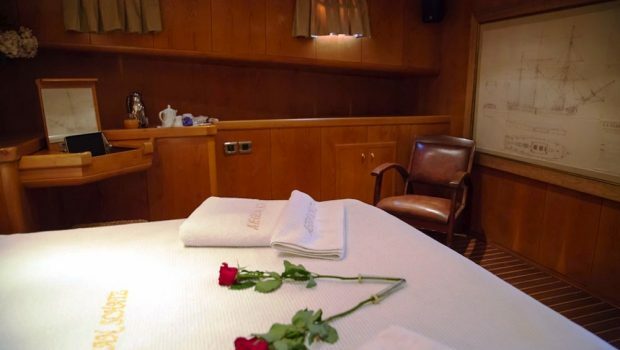 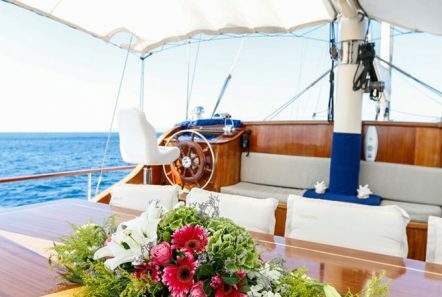 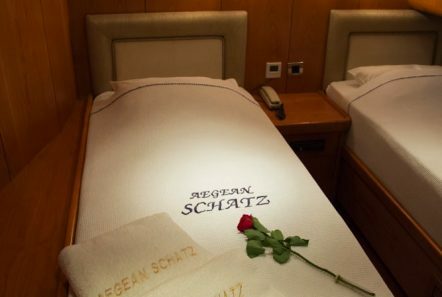 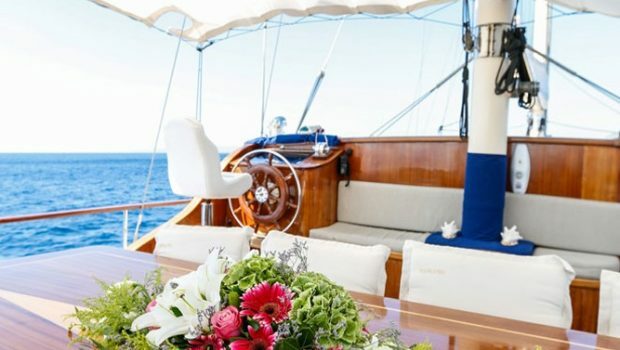 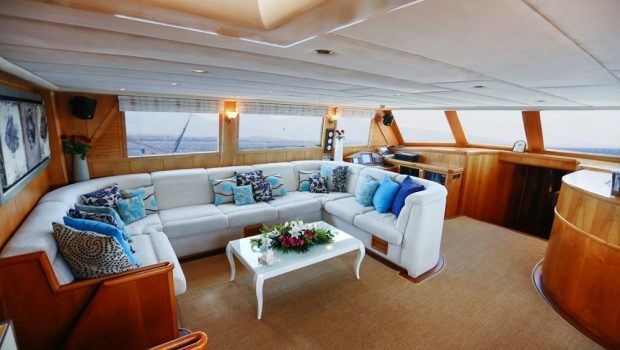 Inside, the salon includes a large sectional-style cream colored leather sofa, with a height adjustable coffee table that functions as an alternative to the aft-deck dining area. In addition, there is a bar, office area complete with internet access, a stereo system and a large plasma flat screen television. 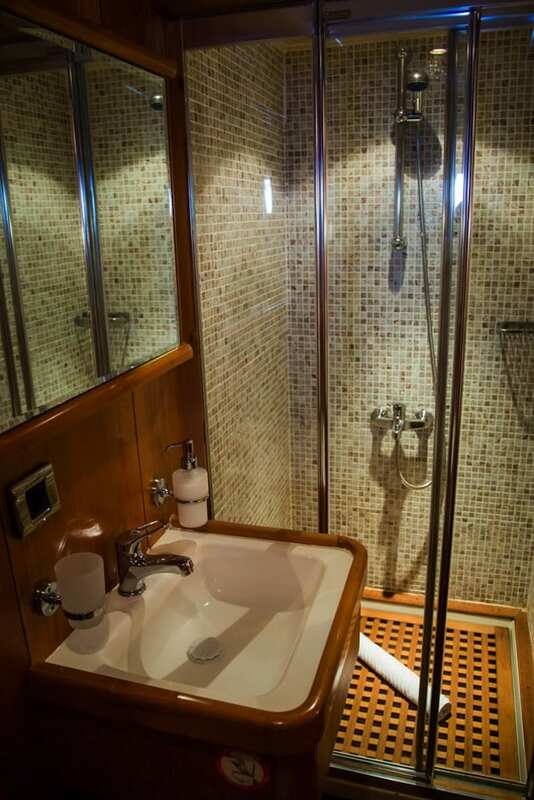 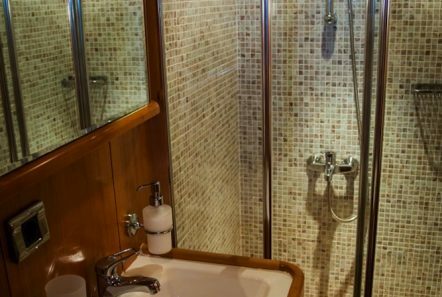 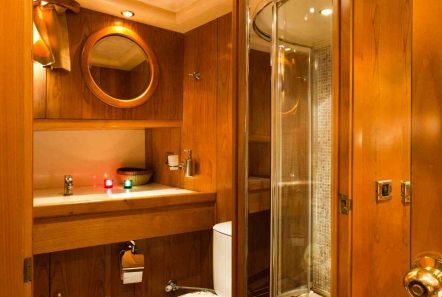 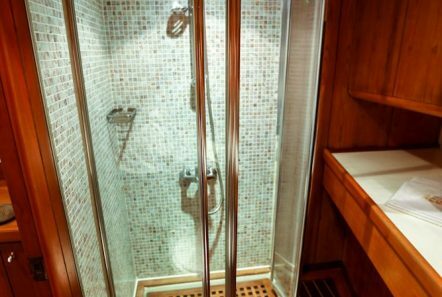 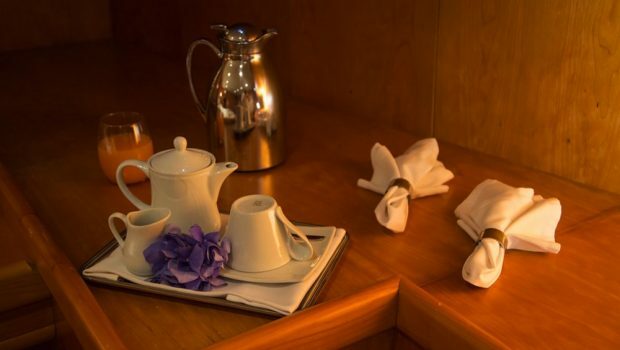 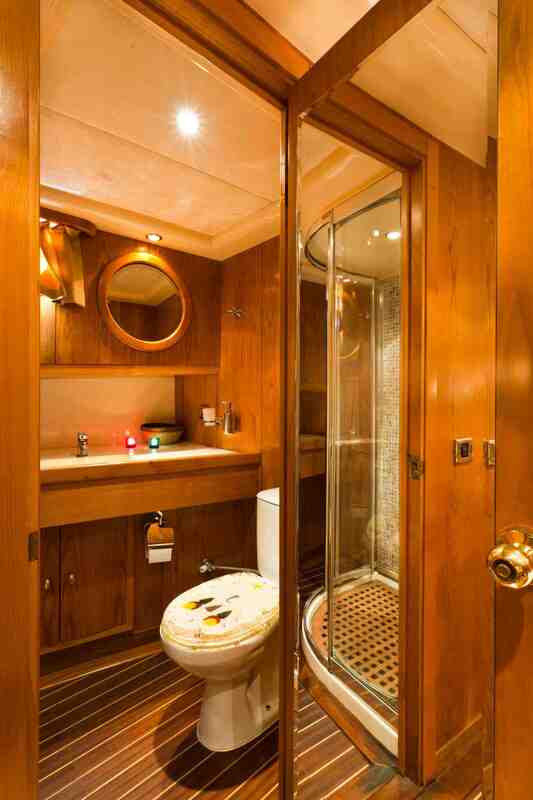 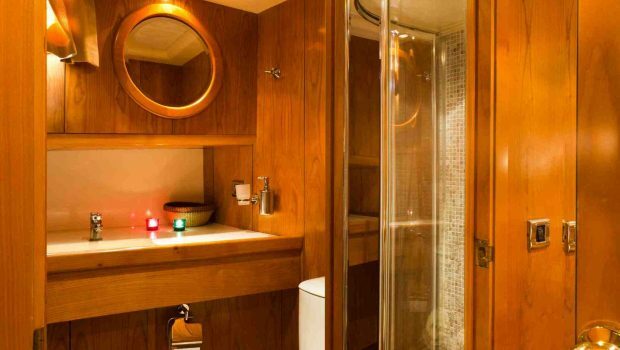 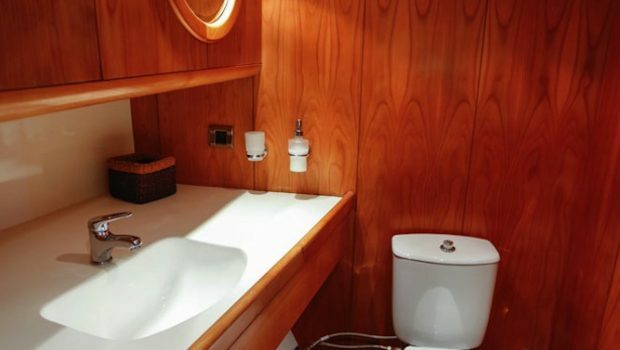 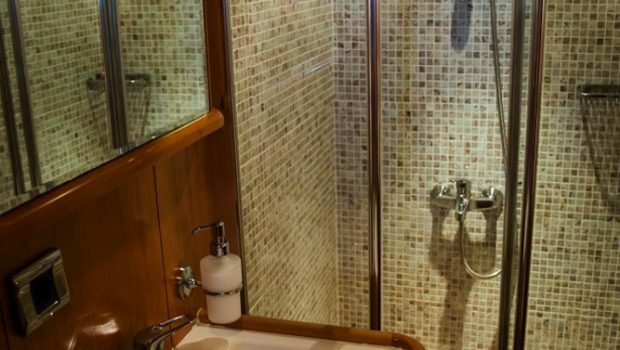 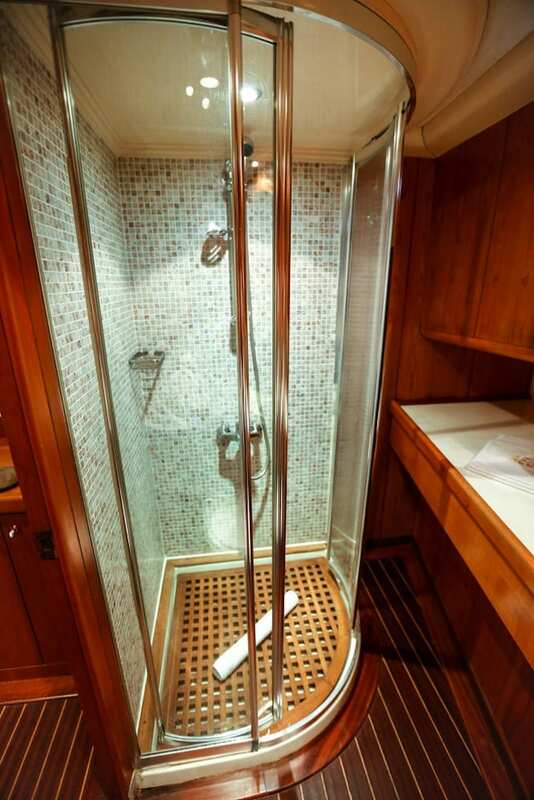 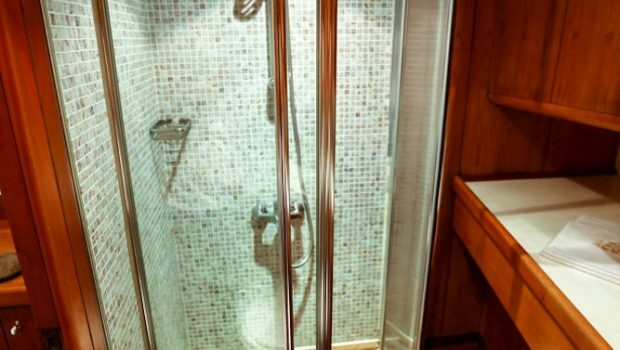 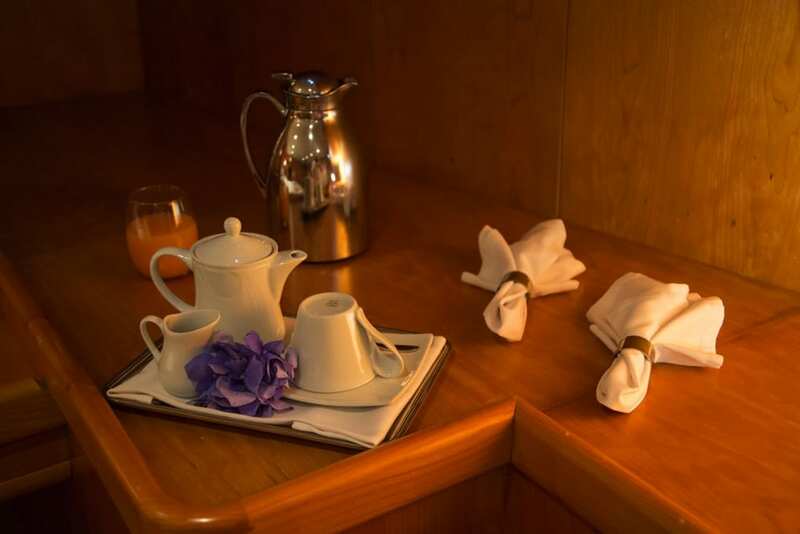 Guests of up to ten are accommodated in five lovely cabins; four doubles and one twin, all with en-suite facilities with full showers lined with handmade Italian tiles. 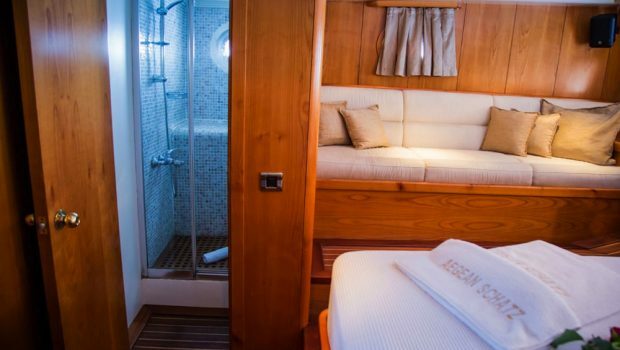 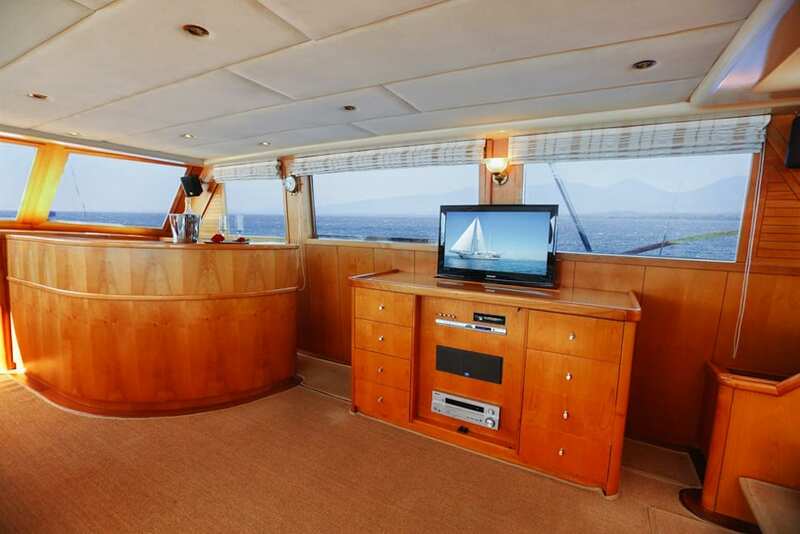 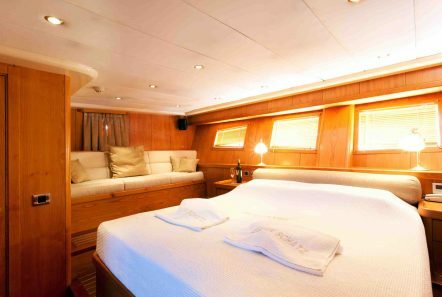 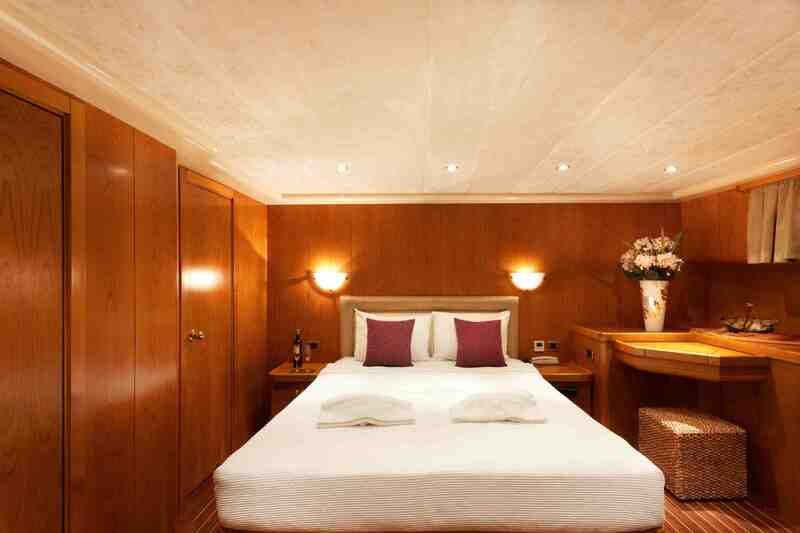 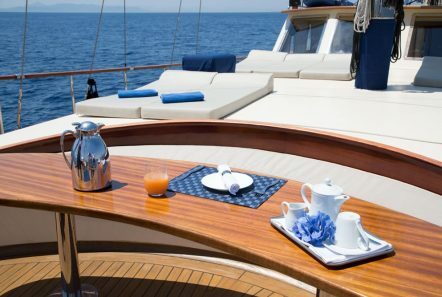 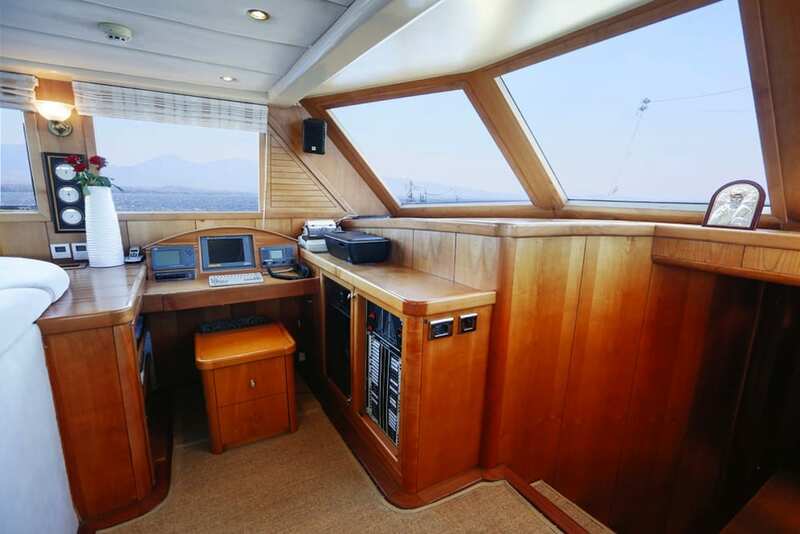 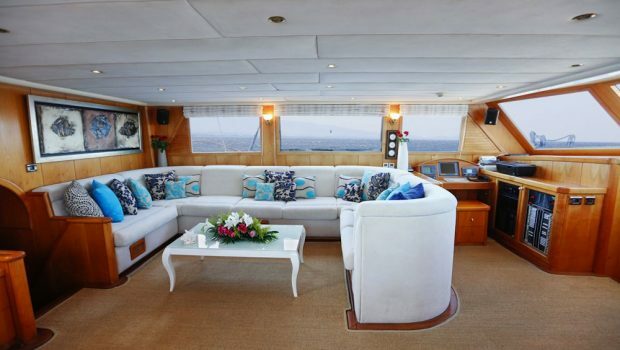 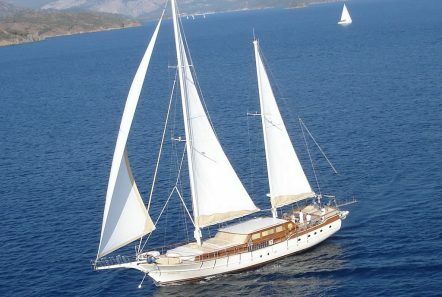 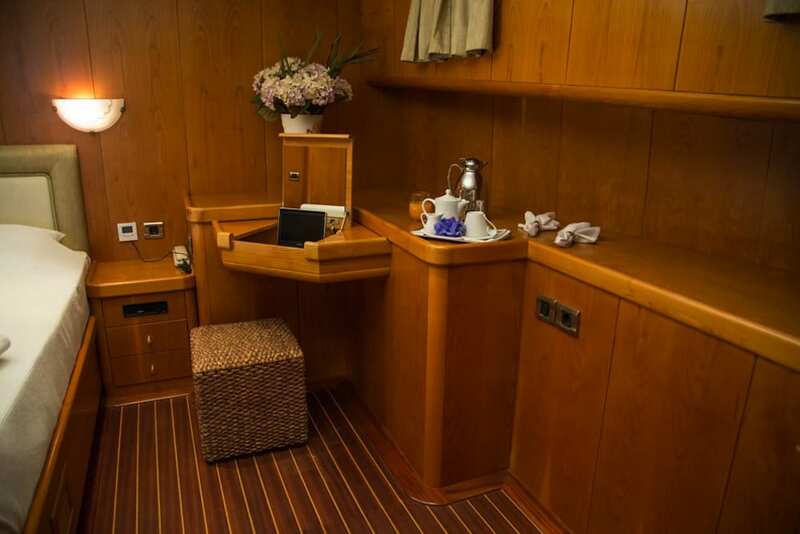 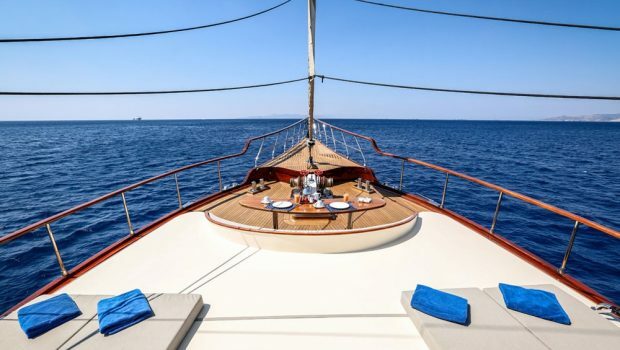 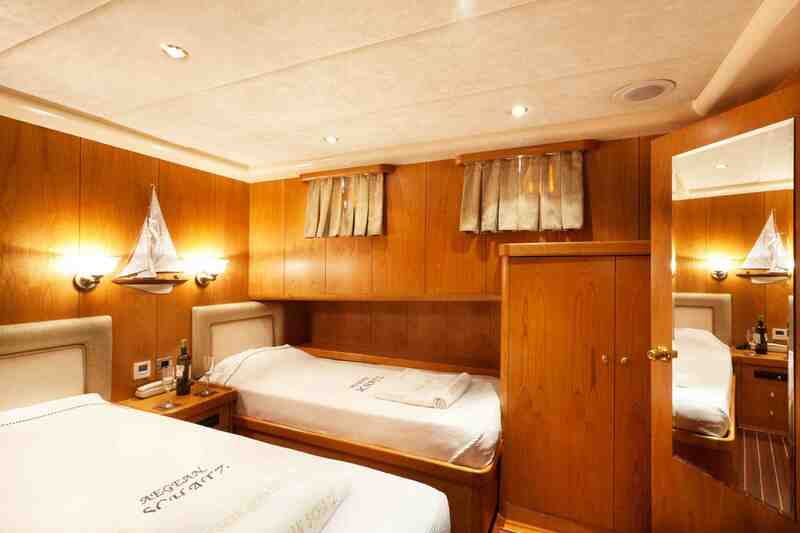 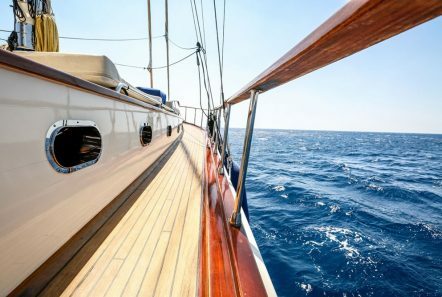 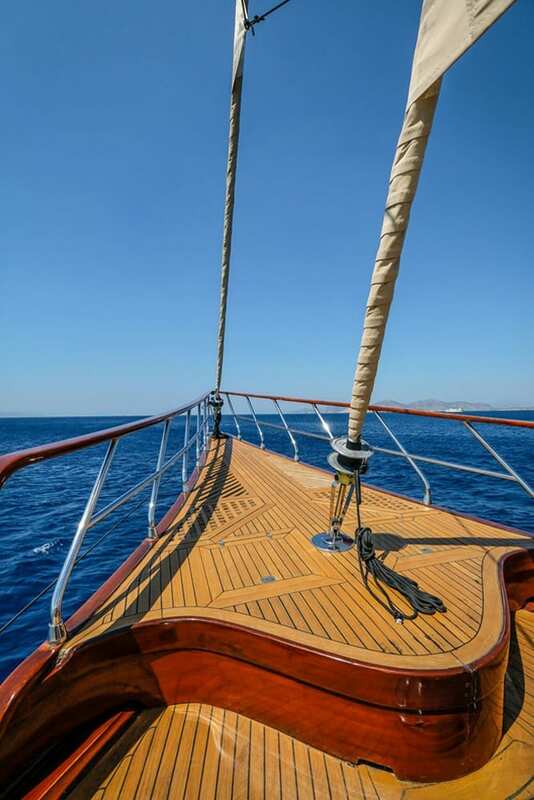 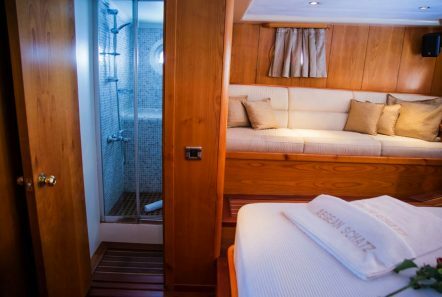 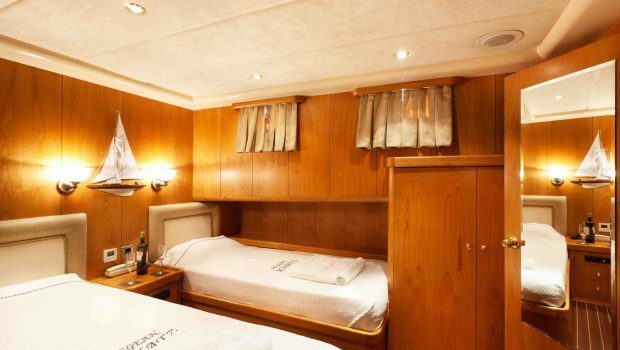 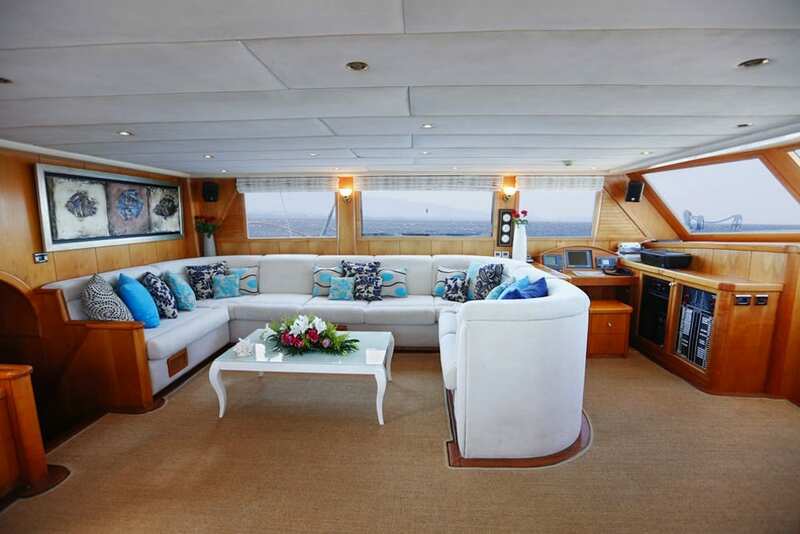 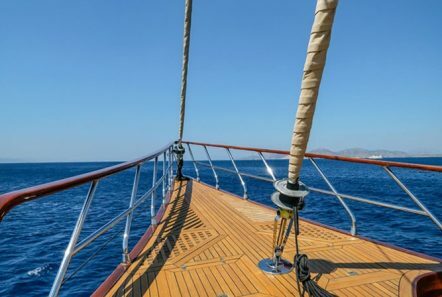 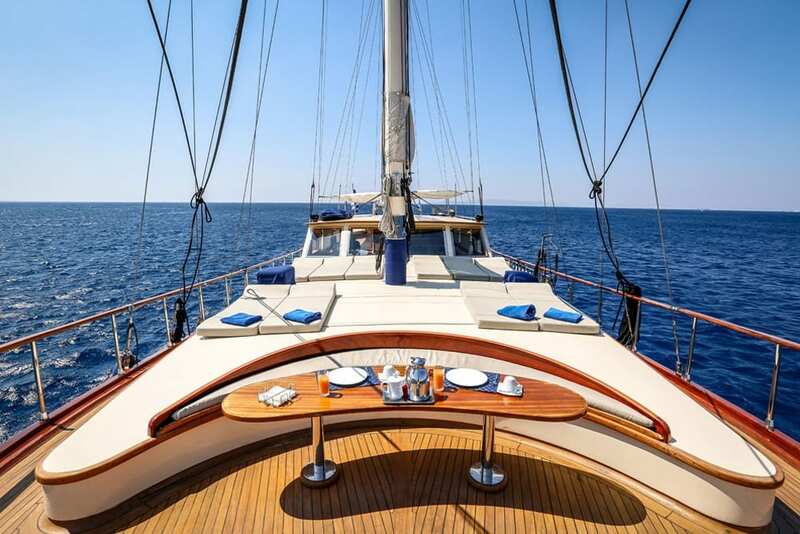 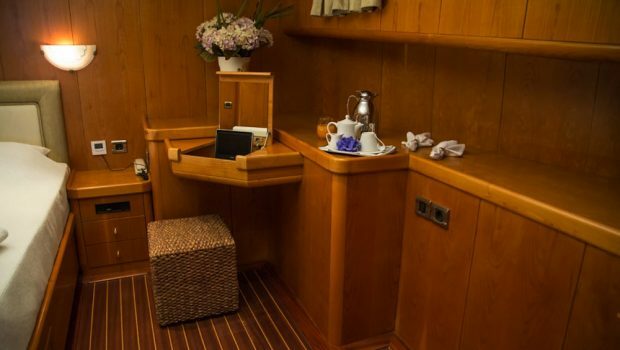 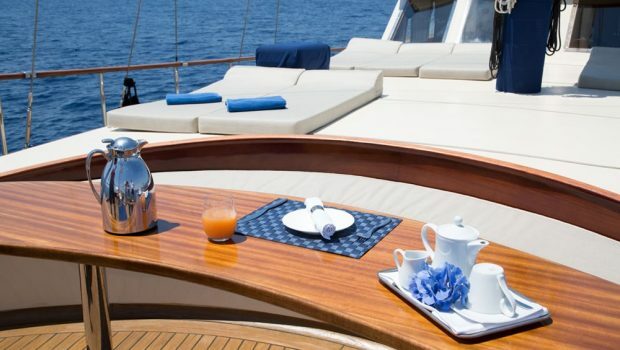 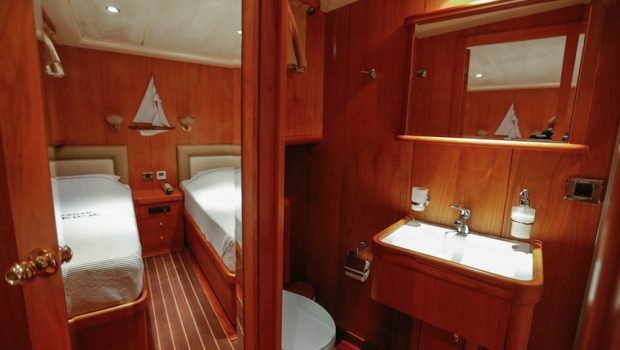 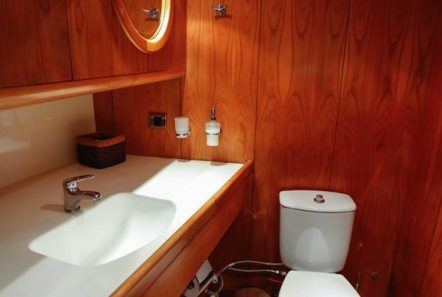 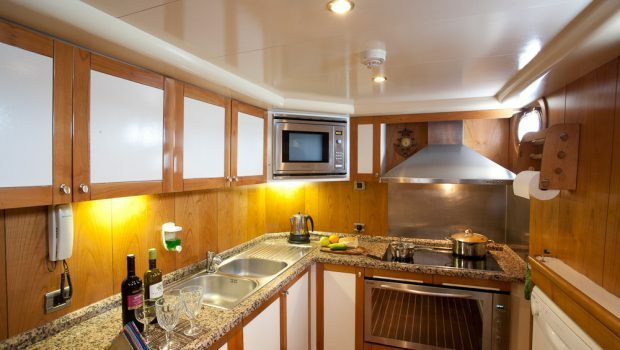 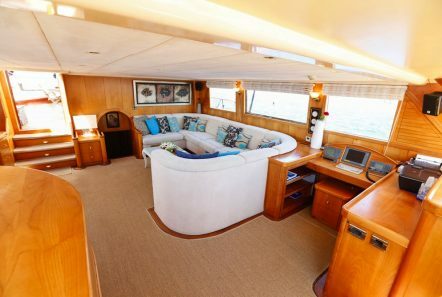 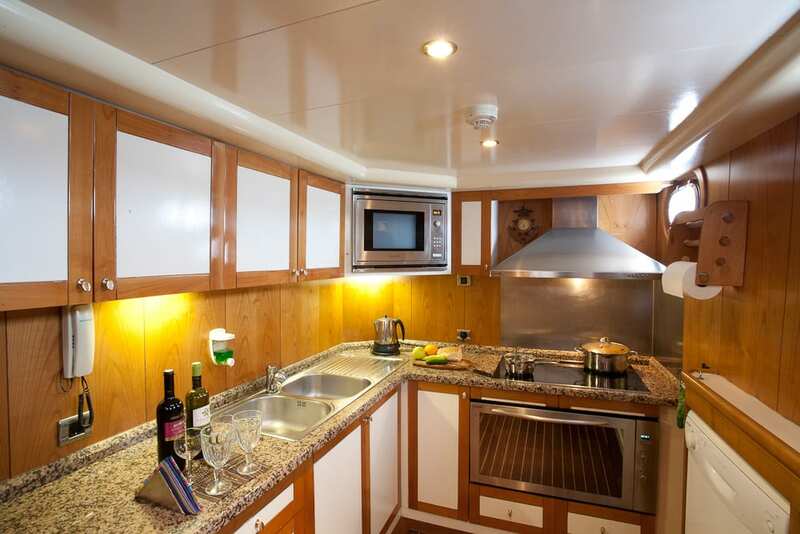 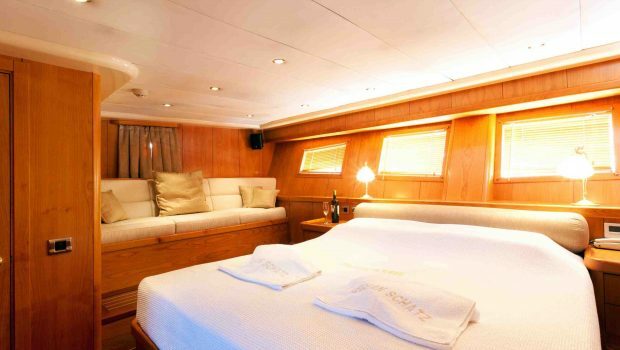 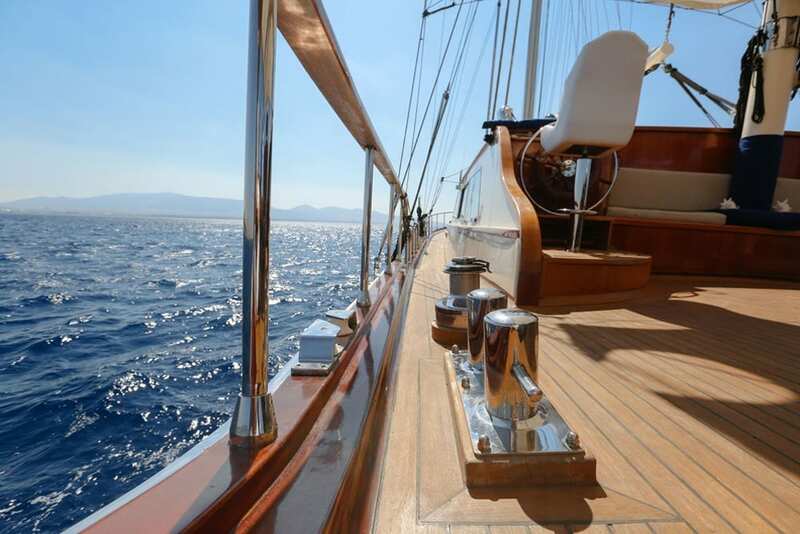 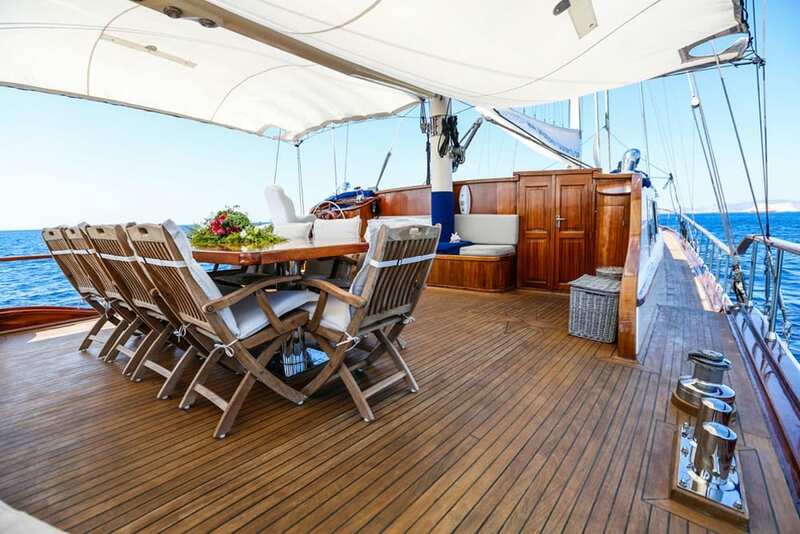 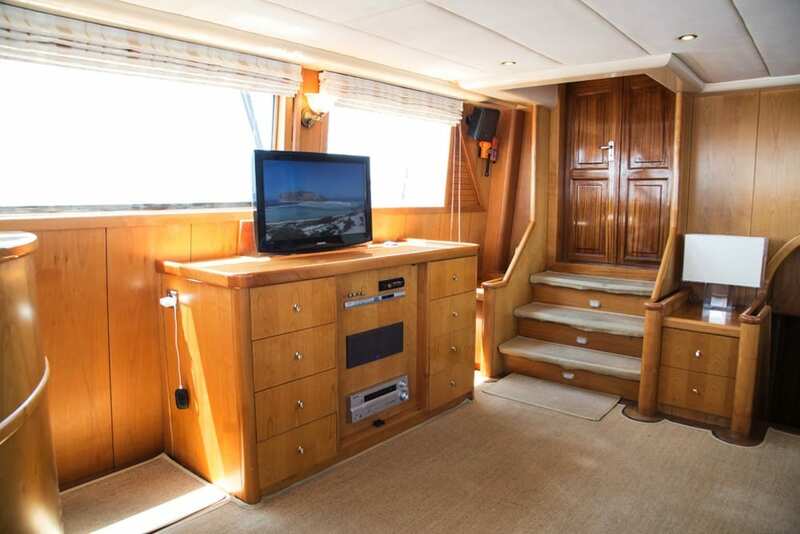 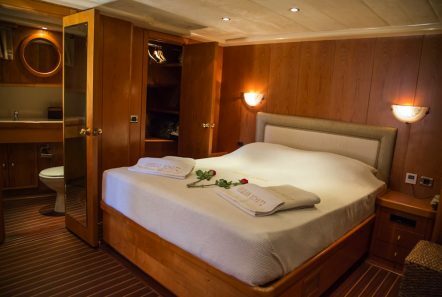 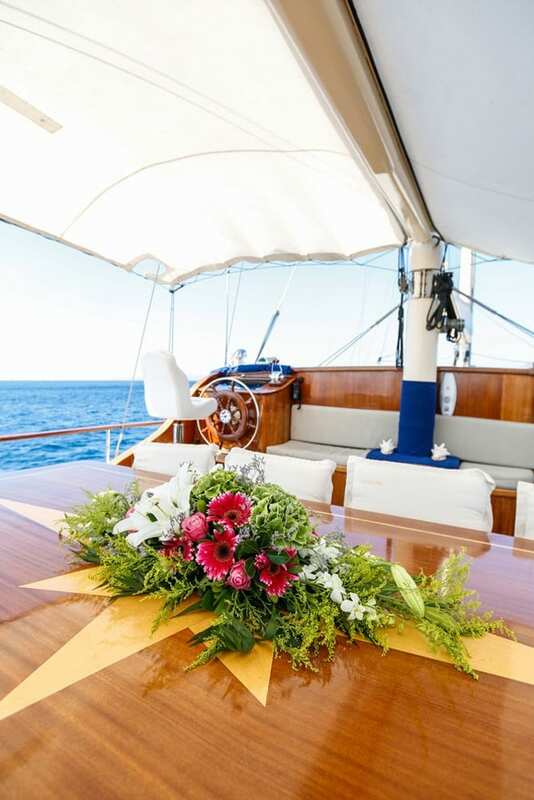 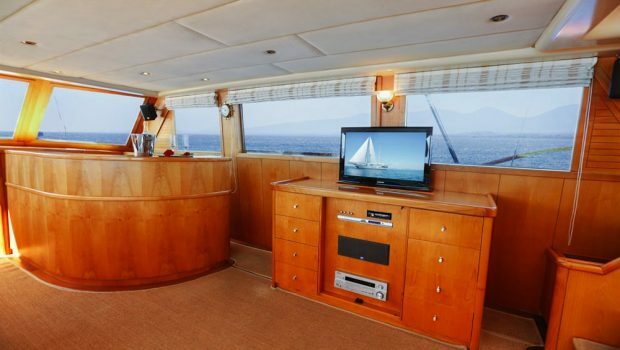 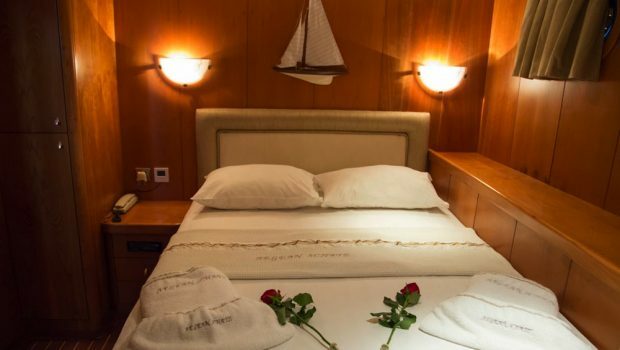 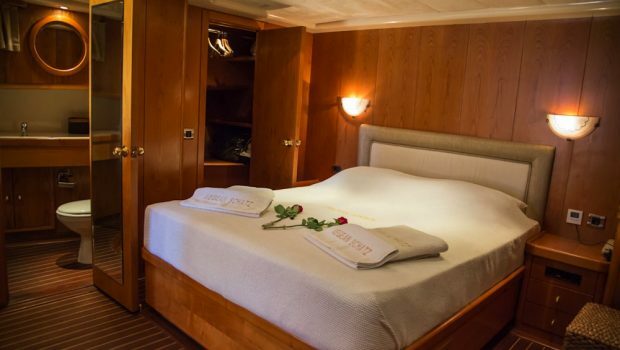 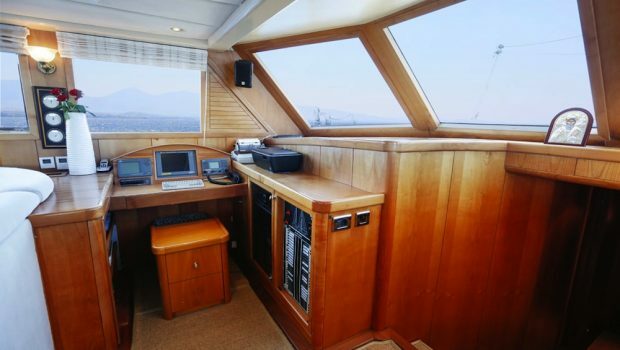 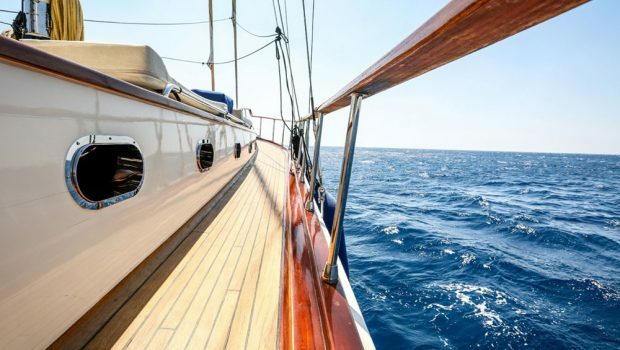 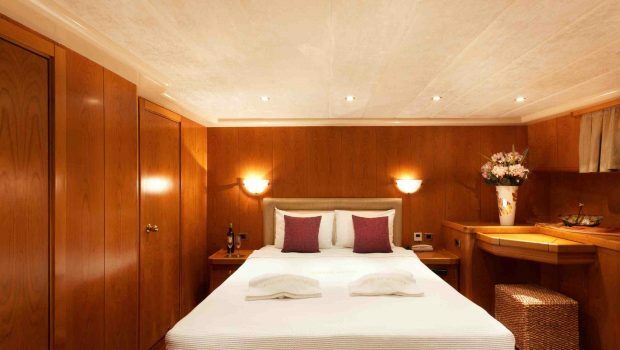 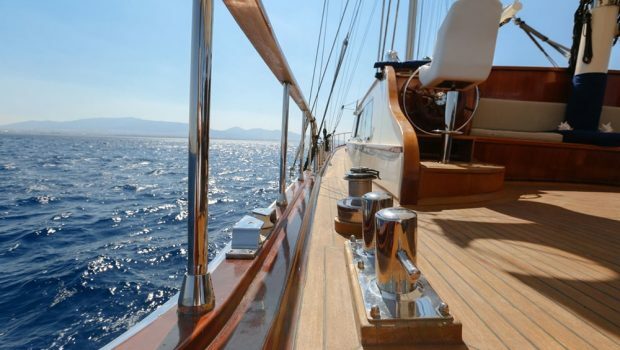 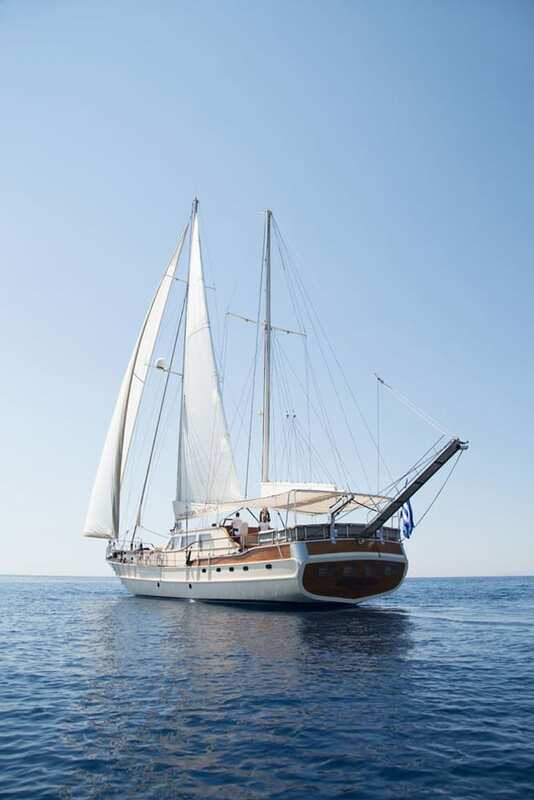 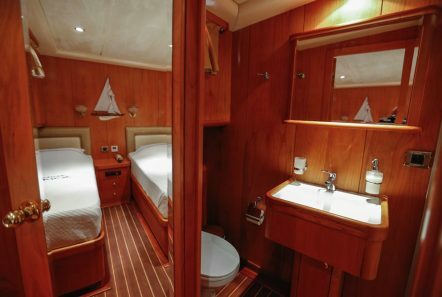 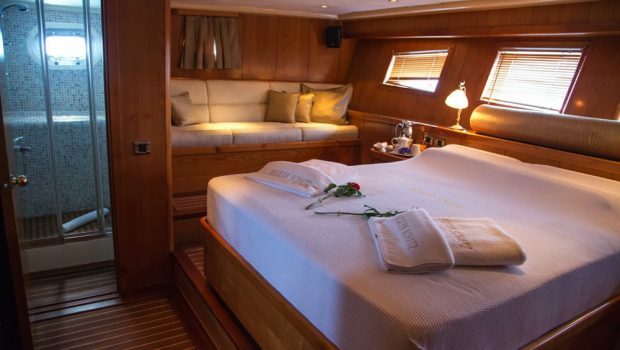 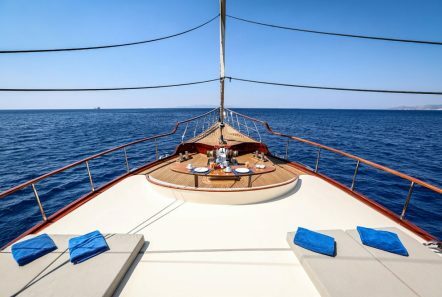 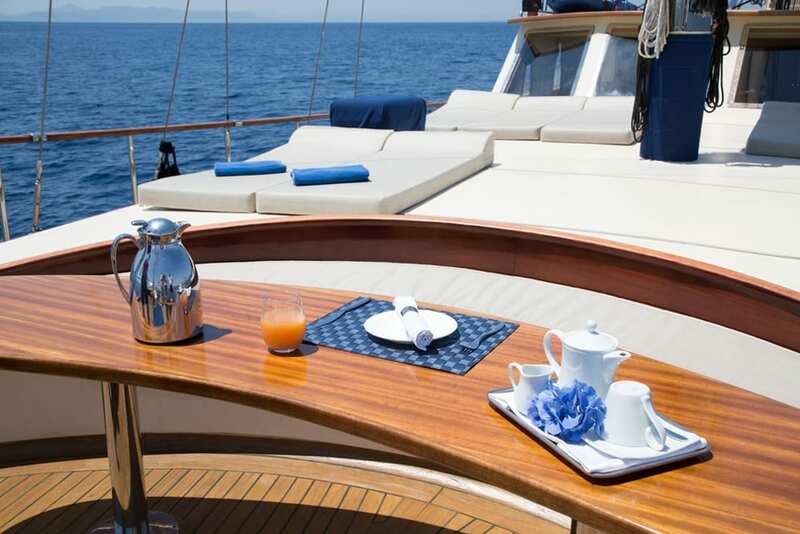 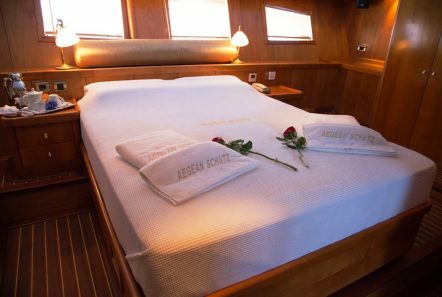 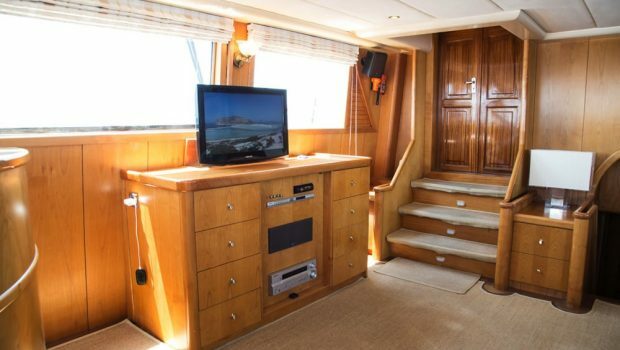 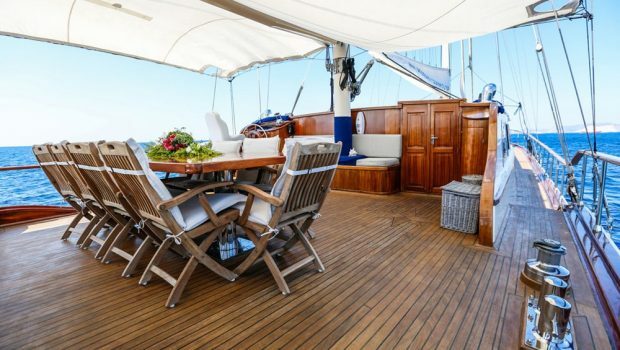 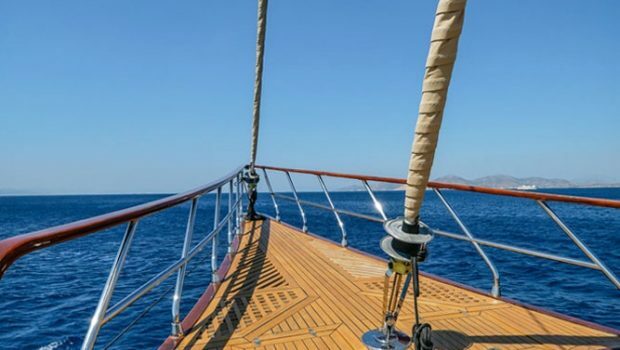 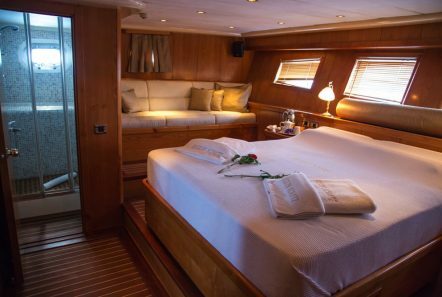 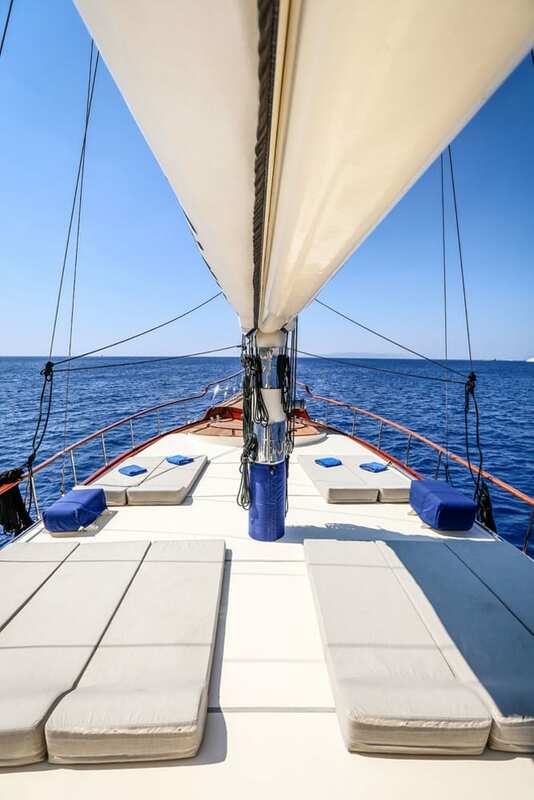 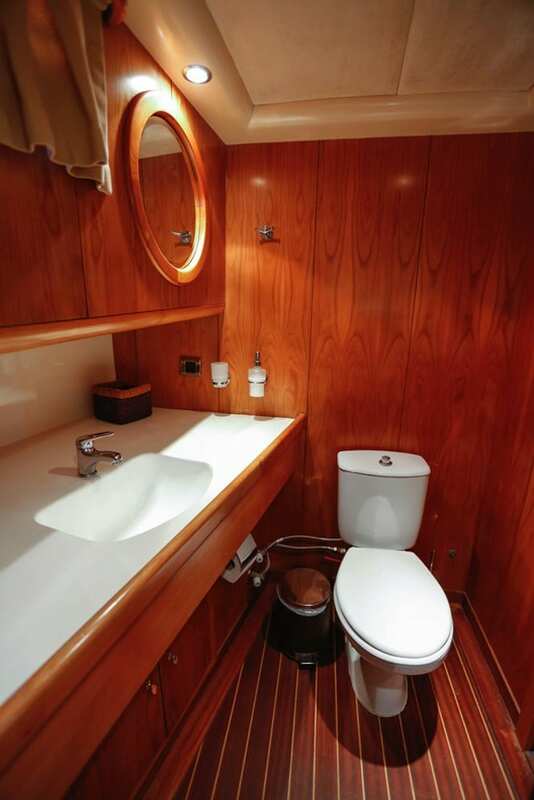 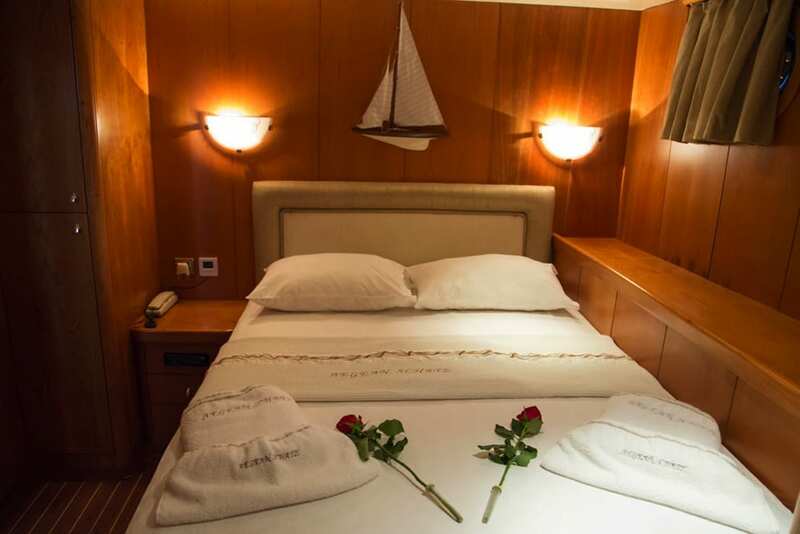 Both the teak fore and aft decks have comfortable mattress areas for sunbathing and relaxing. 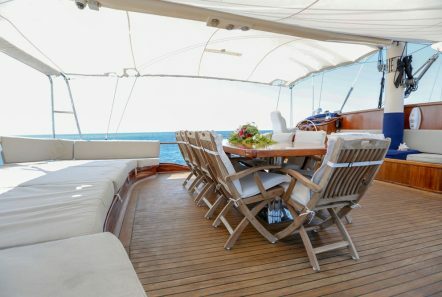 The platform of the fore deck offers a cozy seating area and coffee table for guests to enjoy the sea breeze while sipping a coffee. 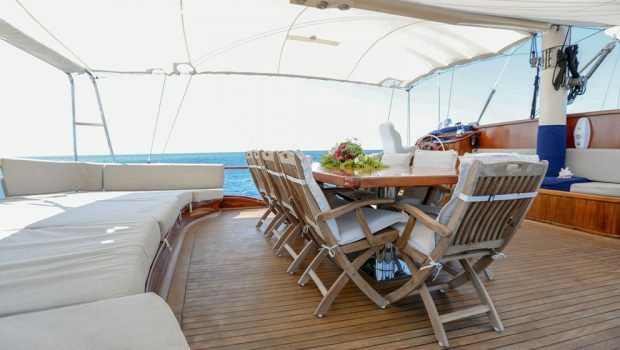 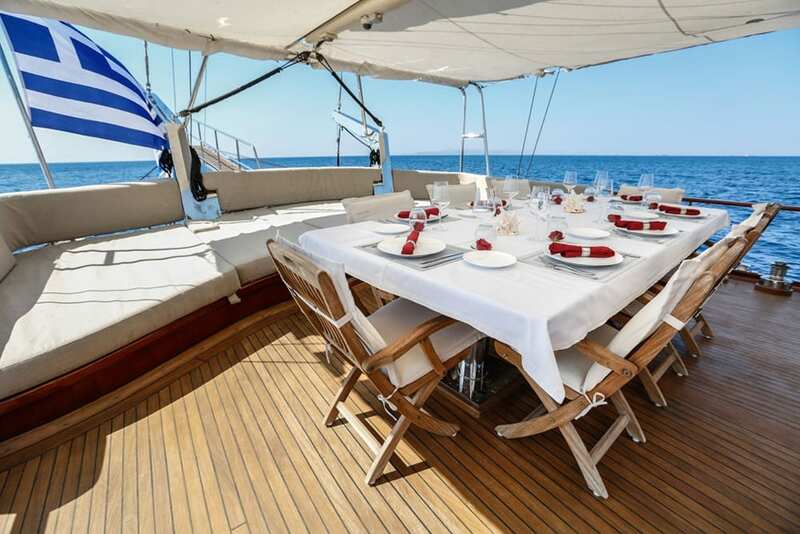 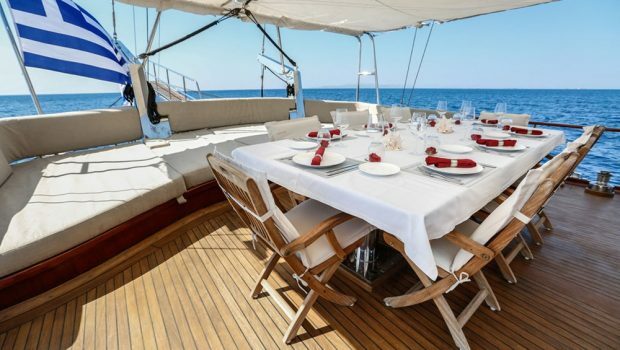 The aft deck, and her large table and cushioned sun beds offers shade from the sun with a canvas bimini top.